Monument to Germans who gave their lives in “the Exodus of Missolonghi”. The Garden of Heroes has a history not found in English internet sources. One must go to google/gr to get a complete insight and visit in person. 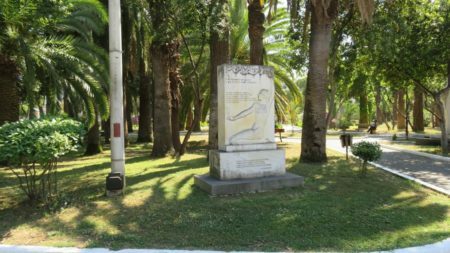 At the entrance is a statue dedicated to the National Poet of Greece, Dionysios Solomos with quotes such as “The Eyes of the soul must always be awake.” There are 69 of Greeks and Phil-Hellenes of historical and artistic importance. 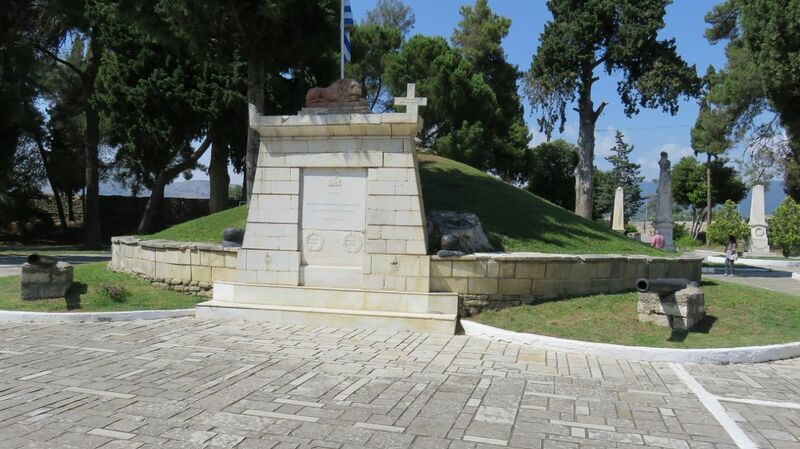 The Tomb of the Fallen with a lion was established by the Greek monarchy of Othon and Amalia. Marcos Botsaris tomb with the statue of the Hellinopoula (Greek girl) is visited by many. 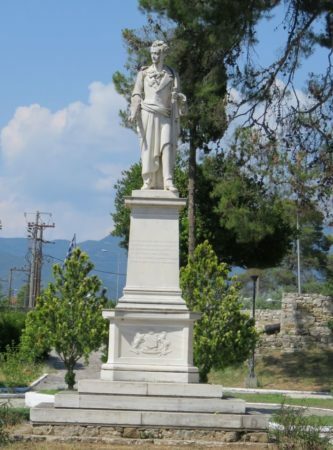 Marcos Botsaris was a heroic Greek Revolutionary hero from Souli, Epirus who died fighting in battle. He is a national figure revered in poetry, literature, and music. I was amazed to learn from a monument that American fighters died at Missolonghi fighting for the freedom of the Greeks from the slavery of the Ottoman Turk Empire that became brutal from 1the 1800’s to 1912. 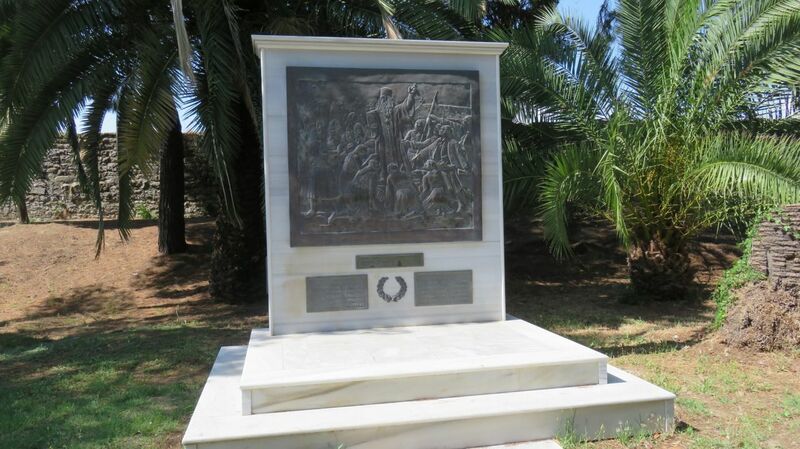 The fallen heroes of Thrace had a monument. A memorial with a poem of Kostis Palamas, praises the fallen German heroes of Missolonghi for “their loyal hearts and sacrifice.”. An amazing monument carving of Greek fighters bowing and listening to the inspiring words of a priest holding a bible and pointing to God, caught my attention. I saw similar images in Moscow museums. Revered heroes are from Thrace, Cyprus, America, and Germany. The “Exodus of Missolonghi” was a mass breakout of the 10,500 population from an Ottoman and Egyptian siege. This defeat was a key factor leading to intervention by the Great Powers who, hearing about the atrocities, felt sympathetic to the Greek cause. Eugene Delacroix’s “Greece on the Ruins of Missolonghi” memorialized the heroes’ sacrifice in The Garden of Heroes. Monument carving of priest inspiring Greek fighters.